The Service Bay service for this type of driveline includes servicing the transaxle and inspecting the CV boot. If the boot is damaged, the CV joint will need to be inspected, and the boot will need to be replaced. If you hear a clicking noise in your wheel wells when you turn, you may have a damaged CV joint. A damaged CV joint should be replaced. The Service Bay service on the drive train on a rear-wheel drive vehicle starts with servicing the differential. It will need its fluid drained and replaced regularly. The seals on the axles should also be inspected for wear or leaks. Leaking or damaged seals may mean the axle needs to be serviced as well. Also, U-joints can wear out. If you hear clunking or feel a jolt when you shift into drive or into reverse, it could indicate a driveline problem. Servicing an all-wheel drive at The Service Bay involves servicing ALL of the differentials and inspecting the joints and seals for wear, leaks or damage. Four-wheel drive vehicles are rear-wheel drive vehicles that have an option to transfer power to the front wheels. In other words, they can be driven as either rear-wheel or four-wheel drive vehicles. These vehicles are specifically designed for the harsh driving conditions Alexandria drivers encounter off-road. 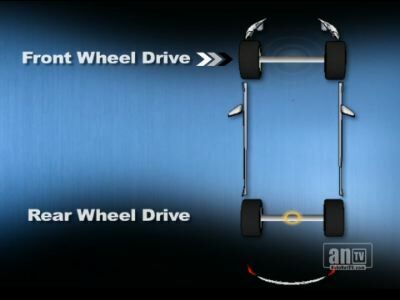 The driveline in a four-wheel drive vehicle is similar to that of an all-wheel drive vehicle. The center differential, however, is a transfer case. Maintenance requires servicing both of the differentials and the transfer case, as well as an inspection of the joints and seals. Alexandria auto owners would be wise to check with their owner's manual for recommendations on how often to service their vehicle drive train. It's also good auto advice to check with your friendly and knowledgeable The Service Bay service advisor as well. You may live in an area in Pennsylvania where weather or driving conditions require more frequent servicing of the drive train. Good car care at The Service Bay in Alexandria always includes taking care of your driveline. Without it, your vehicle becomes a very large paperweight.